Week THREE: We stayed on the grass and did relay-based training. Week FOUR: We went to the park at the back of school. It’s great to run in the trees and get a few twists, turns and hills done. It was very dry and dusty though. 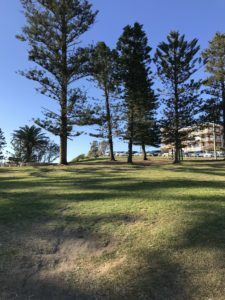 Week FIVE: We headed down to Avalon Beach and ran some hills. Six of the hills shown in the photo and then a quick look at some perfect waves and then back to school. Week SIX: An old favourite – the bucket run. Shorter repetitions than usual – but the focus was the same; to try to run the same distance for each of six repetitions. Week SEVEN: Steeplechase. Six reps of 250m with four hurdles and a chicane. Great positive group this week. We have School Fun Run to look forward to later in the term and some lovely spring weather on the way. There will not be any more training group this term but I look forward to seeing you next term. I haven’t posted a video of the week for a while, but I had to share this one. The Emsley Carr Mile took place in Birmingham in the UK as part of the annual Diamond League meeting. This race has a long history of high class races and the 2018 edition was fantastic to watch, especially for Australians. Stewart McSweyn is having an amazing season, setting personal bests in almost every race. In previous years, he has raced 10,000m, 5,000m and Steeplechase, so it was interesting to see what he would do stepping down to the Mile and racing against Olympians Ryan Greyson (Australia) and Paul Chelimo (USA).